The Vikings listed three players as questionable to play Sunday against Miami. 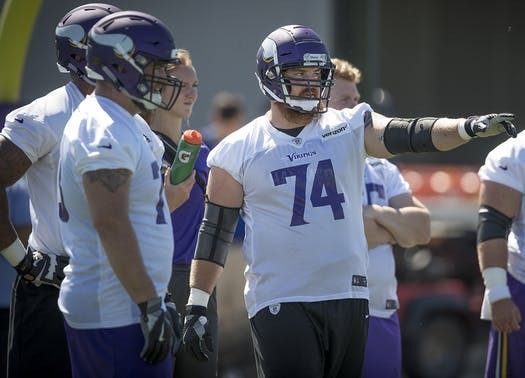 The Vikings listed three players — right guard Mike Remmers (low back), defensive tackle Sheldon Richardson (hip) and tight end David Morgan (knee) — as questionable to play Sunday against the Dolphins. But at least one, Remmers, has no doubt he’s playing. All three players were limited in practices throughout the week. Richardson, who played 45 snaps (68 percent) on Monday night in Seattle, did not miss a practice this week and has not been sidelined for a game this season. It’s worth pointing to the Vikings having a shortened recovery coming off the Monday night game, so limiting players in practice might’ve been more necessary. Morgan returned to practice this week after being sidelined the past four games due to a sprained knee. Sunday will mark the first time since the Nov. 4 injury the Vikings offense could again feature Morgan, a blocking specialist, in the lineup. Receiver Chad Beebe (hamstring) has been ruled out for a fourth straight game. Dolphins’ injury report: S T.J. McDonald (ankle) is questionable to play. CB Xavien Howard (knee) is listed doubtful. It appears the Dolphins will be without Howard, their top cornerback who is tied for the league lead with seven interceptions.